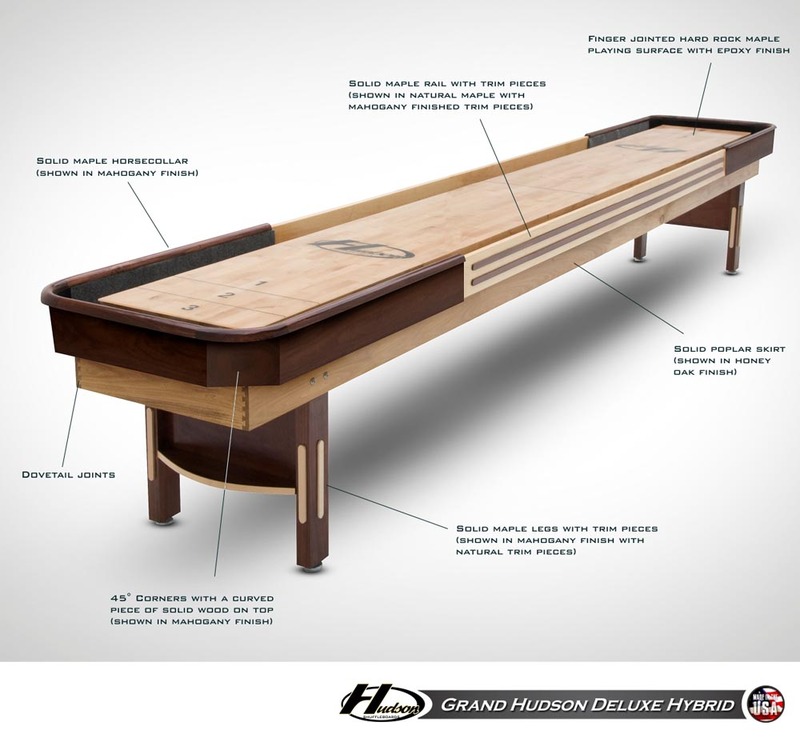 Hudson is a brand well known for its masterfully built shuffleboard tables. The models that Hudson has produced over the years have always had their unique touch of engineering magic. With the number of categories to choose from, it may seem hard to differentiate between them at first. Nowhere is this more visible than in the Grand Hudson, the Grand Hudson Deluxe, and the Grand Hudson Deluxe Hybrid. While their names are similar, each comes with its own set of features that can impact your purchasing experience. The original Grand Hudson embodies the look and feelings of down-to-earth, classic Americana. Master craftsmanship and quality materials are coupled with the fact that each is made proudly in the USA. Each shuffleboard is made with the utmost care, meticulous attention to detail, and heartfelt determination to always produce works of art. 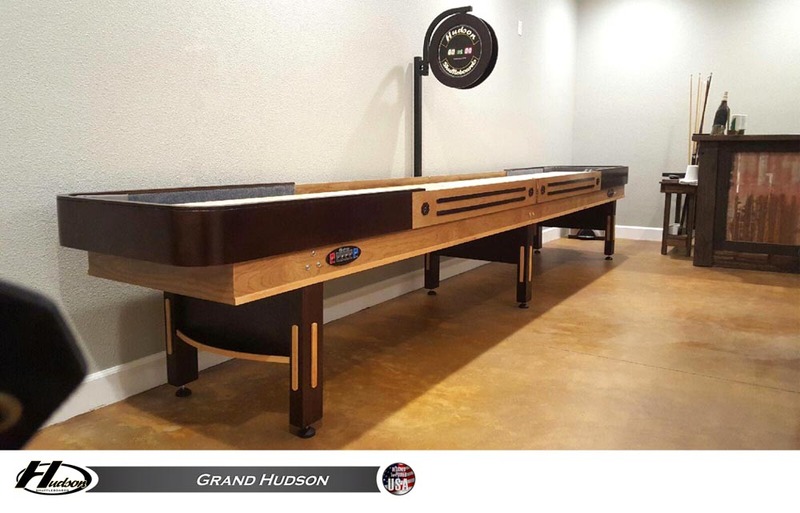 Each Grand Hudson’s playing surface is made with the optimal industrial standard 3” thickness, with a tournament-quality polymer finish that’s widely preferred by shuffleboard professionals. Hudson’s polymer finish is specially made, and carries with it a lifetime guarantee. Hudson tables have built-in features meant to protect your shuffleboard for years to come. Climatic adjusters are included with each shuffleboard table. Climatic adjusters integral to help protect the wooden playfield from cracking and warping due to natural changes in temperature and humidity. Protective cushions hug the inside horsecollar rail walls at each end, reducing the damage caused by the blows of weights zooming towards the ends of the playfield. These cushions come in fashionable gray, green, or burgundy. To protect the weights pushed off the sides and into the gutters, the Grand Hudson Shuffleboard’s alleys are covered in gray carpet. The Grand Hudson’s cradle is constructed of a high-density fiberboard with a maple veneer. The cradle has light maple and rich espresso finishes, while the legs have espresso finishes with maple trim pieces, enhancing the overall beauty. The Grand Hudson Deluxe’s cradle and legs are made entirely out of solid poplar and maple hardwoods, a characteristic sought after by experienced shuffleboard players for their durability and reliability. The corners on the horsecollar are milled out of a single piece of wood. This is a feature that is completely unique, found only on this Hudson Shuffleboard. It serves to add extra endurance, extending the life of your shuffleboard. As compared to the regular Grand Hudson, the wood finishes of each Grand Hudson Deluxe table can be customized with your choice of stains. You can also add different types of scoreboards to your table for more competitive gameplay. You have the option of electronic scoreboards, wood framed chalkboards, or abacus beads; whichever you prefer! The Grand Hudson Deluxe Hybrid is a fascinating take on the original Grand Hudson’s already elegant design. Each corner of the shuffleboard cradle has rounded (also called radial) toprails. Under each corner’s rounded toprail is an upper cradle with flat corners, giving it an octagonal-shaped frame. Underneath this upper octagonal cradle sits the lower rectangular cradle, which forms the underbelly of the table. Like the Grand Hudson Deluxe, the Grand Hudson Deluxe Hybrid comes in your choice of stains (or combination of stains), already included in the price. 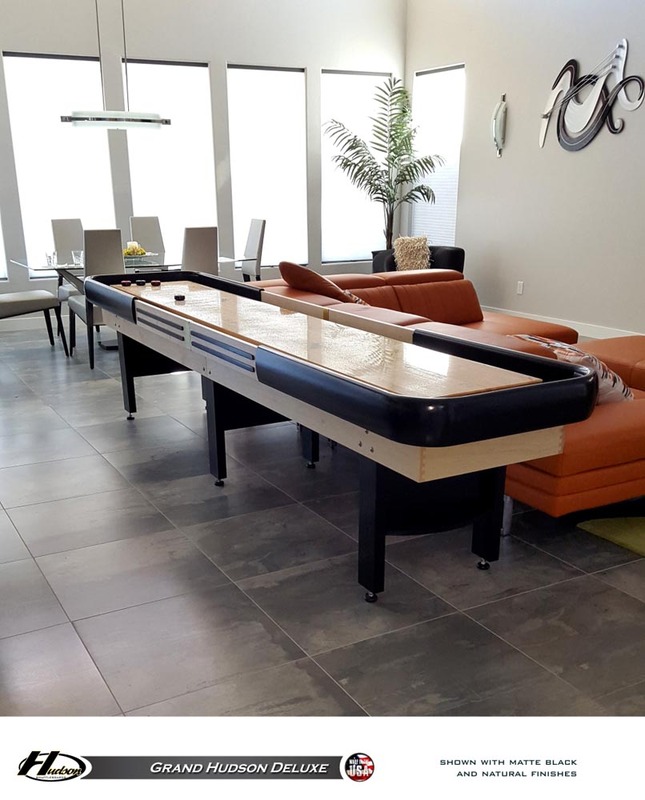 All Hudson shuffleboards are prime examples of tireless excellence, and these three are no exception, so take a look at them and make your dream purchase today! This entry was posted in Hudson Shuffleboard by Luke Mitchell. Bookmark the permalink.